Director's Note, January 22nd: Safety Committee Update, Spelling Bee, Lunch Program, and More! This is a wonderfully busy time of year for staff and teachers at Bridges! As classroom and after school activities on campus continue in full force, we are simultaneously beginning our processes of planning and goal setting for our 2019-2020 school year! The Middle School Art Show is Today! Stop in to the MPR today before pickup to walk through our student art show! Ms. Laura is serving sparkling juice. The art show will be viewable from 1:15-2:20. We are seeing more interest than ever from parents wanting to learn more about our educational programs at Bridges. Our first Parent Information Night was held last week and we had a full house with more than 70 parents in attendance. At the Parent Information Nights, families have the opportunity to learn about our unique program for supporting students’ social emotional development, they have the opportunity to hear about our exceptional kindergarten program, and they hear about the new approaches we are taking with math instruction and project based learning. These evenings are also a wonderful opportunity for our current families to learn about what learning looks like in different grade spans at Bridges. Current families can also RSVP to an upcoming PIN to learn more about what sets us apart from local schools and how we continue to improve and develop. Please note on our school calendar that there is no school for students next Monday, January 28th. Our teachers will be continuing their staff development on Monday by working with their partner teachers on curriculum mapping for Science, Math, and English for the 2019-2020 school year. These opportunities for collaboration and co-planning help ensure cohesion of concepts, skills, and content across grade levels. Since students are not in school, PAC is hosting a Kids World Fundraiser from 11-2pm! Our school Safety Committee is comprised of parents, teachers, staff and board members, and meets regularly to discuss improvements to be made for campus security and student safety. The Safety Committee also is involved in helping us assess our success at executing emergency drills. Under the recommendation of the Safety Committee, we have invited our School Resource Officer to lead a training with our staff and teachers on being prepared for Active Shooter scenarios. Additionally, we have been getting quotes for the installation of security cameras to be installed in hallways and at entry points on campus. Our Safety Committee has also been working to update our Emergency Procedures along with our Expectations for student behavior and academic responsibility to be revised for our 2019/2020 school year. Our administration and Board of Directors has been researching meal programs to implement next school year. We are researching the process of implementing the National School Lunch Program (NSLP); for families who meet certain income eligibility, this will mean that Bridges Charter School will be able to provide free or reduced cost lunch, and likely breakfast to students whose family have a financial need. We are excited to share more details with you as we make decisions in the coming months! Parent Education Nights -- Starting this Week! Thursday, January 24 at 6:30! Shoshana Wheeler, parenting and nonviolent communication expert, is leading a series of six parent discussions that we have opened up not just to Bridges parents, but to our whole community! The classes are donation based and nobody will be turned away for lack of funds. Please spread the word to your friends, and join us to learn useful parenting strategies and to dialogue with other parents in a supportive setting! Our classroom spelling bees are taking place this week! The top two students from each grade level will move on to our whole school Spelling Bee which is to be held next Thursday, January 31st at 3pm. We are still looking for several parent volunteers to help with the whole school spelling bee! Attendance dropped significantly last week, and we need to rebound. Parents, please be very mindful about scheduling vacations, trips, and non-urgent doctor’s appointments on non-school days. After School Enrichment Classes Starting Soon! Make sure to stop by the front office to get more information about our next cycle of after school enrichment classes forming now! There is a Level 1 and Level 2 Lego Robotics class for students in grades 3-8, an Art Ninja class, and a Mad Scientist class starting soon! 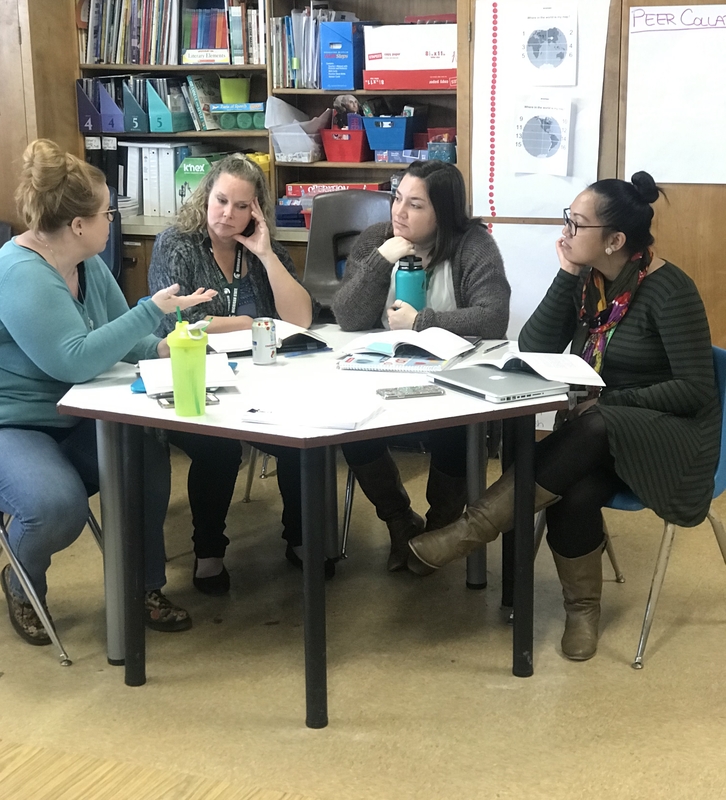 Bridges teachers collaborating last week during our minimum days on best practices for teaching non-native English speakers in their classrooms.